There’s certainly no shortage of books on how to lead a church. If you’d just take the time to browse through some of them you would likely find the following plan offered: sharply define your church’s unique mission and then make whatever changes that are required to pursue it. On the surface this seems very intuitive and doable until we ask, “What is meant by sharply defining your church’s mission?” This task often becomes an exhausting undertaking that can focus energy away from primitive Christianity to figuring out how to break the complex code of missional success that will usher in what everybody wants but are shy to say: quantitative growth. After a few books like these a pastor soon discovers to his horror that to be “successful” he must substantially broaden his skill set. He will have to become a sociologist, demographer, interior designer, graphic artist, consummate marketer, and cultural clairvoyant in order (1) to detect the particular alignment of nearly intangible variables in his context, (2) to form a mission around them, and then (3) to alter his church to get the coveted results. Many pastors who are already overwhelmed with responsibilities and underwhelmed at the prospects of personally becoming cultural and ecclesial innovators simply replicate the ministry-models that proved successful for the authors they are reading. Others resign themselves to mediocrity, redefining “success” as the particular ways they have failed. It with this bookish backdrop that Mark Dever and Paul Alexander’s book, The Deliberate Church, is a breath of fresh air. As much as missional code-breaking may have some validity, the point of this book is that any and all leadership endeavors that do not place the bulk of energy and effort on Biblically delineated priorities, practices, and structures are doomed to fail by God’s measurement of success. But therein lies hope for the non-professional pastor. God has been quite vocal and clear on what we are to do, and in some general sense, how we are to do it. The doctrine of the perspicuity of Scripture is equally applicable to a pastor understanding how to lead a church as it is to a member of that church understanding the gospel. Though the task requires nothing less than the mortification of the flesh and the abandonment of ourselves to the sufficiency of grace, it certainly is not a task reserved only for the highly qualified or gifted specialist. In the first of four major sections the authors address the particular responsibilities that a pastor has when “Gathering the Church.” They delineate four: Preaching, Praying, Personal Discipleship, and Patience. As to the first, since “God’s word builds his church…preaching his gospel is primary” (35). Again, since “God’s word has always been his chosen instrument to create, convict, and conform his people,” it stands to reason that a minister would be marked primarily as a herald of this word (33). As to prayer, this sacred duty is listed in the apostolic witness as a responsibility so great that it is coupled with preaching itself (Acts 6:4). Though a great responsibility, the application can be quite unassuming. The authors suggest the simple practice of assembling a church directory and leading the elders and members of the church to pray daily for those listed. Then there are the tasks of personal discipleship and patience. As to the former, a pastor who deliberately invests in a half a dozen specific people will find his influence in the church significantly increased, as well as his understanding, practical care, and ability to raise up leaders enhanced. With respect to the later, “if we define success in terms of size, your desire for numerical growth will probably outrun your patience with the congregation, and perhaps even your fidelity to biblical methods” (40). Patience is a fruit of trusting the chief pastor of the flock to lead at his pace. As one embarks on gathering the church, the authors also address some fundamental tasks of laying a foundation. At the core of building a foundation is the gospel itself. Specifically, a pastor ought to make Jesus’ person and work the primary objective of everything said and done. This is critical for the great commission mandate, for “what you win them with is likely what you’ll win them to. If you win them with the gospel, you’ll win them to the gospel. If you win them with technique, programs, entertainment, and personal charisma, you might end up winning them to yourself and to your methods” (44). A corollary of church membership ought to be church discipline. That function of membership unfortunately has negative connotations. Scripture, however, teaches that it is meant for the flourishing of people. Dever and Alexander provide the helpful and traditional two-fold category of “formative” and “corrective” discipline. The first is “like eating right and exercising,” and the second is like “surgery” (67). The two categories and illustrations provided diffuse the bad press church discipline has received. Especially helpful was Dever’s use of a “Care List” in taking measures to implement corrective discipline. For example, let’s say that a certain member has been absent from church, that member would be transferred on to a “care list” which would become a catalyst for pastor or member engagement (70-71). Since foundation building is bound with a clear understanding of the gospel, Dever and Alexander offer a way to remember the key ingredients to be included in any gospel presentation: God, man, Christ, and response. Moreover, not only will a healthy church strive to maintain the purity and priority of the message by emphasizing these ingredients, but also such a church will strive for a purity of presentation. At the very least this means that the gospel will be presented in ways that avoid manipulation and guard against giving false assurance to the respondents. “What this means is that we shouldn’t encourage people to feel assured in their salvation based simply on a prayer prayed, with no observable fruit of repentance in their lives” (53). Failure to lead against such common trends is to do an eternal disservice to the “evangelized.” But also a grave disservice is done to the church by allowing its visible membership to become unnecessarily tainted with the unregenerate. The second section of the book is entitled “When the Church Gathers” and is concerned with understanding and applying the Regulative Principle. By the “Regulative Principle” the authors mean that when a local church gathers together to worship God, whatever they do, it “must be clearly warranted by Scripture.” This principle stands in some contrast with the Normative Principle that states, “as long as a practice is not biblically forbidden, a church is free to use it to order its corporate life and worship” (78). After making a compelling case for the Regulative Principle, the basic scaffolding of the principle in a church’s corporate life is offered in this memorable way: read the Word, preach the Word, pray the Word, sing the Word, and see the Word (81). Reading the Word means simply that portions of God’s Word should be read aloud “without comment” to and with the congregation. Preaching the Word is “a regular diet of specifically evangelistic expository preaching.” Praying the Word is that weekly corporate act of “praying God’s Word back to Him” as a response to His self-revelation. Singing the Word is the congregationally involved act of singing songs that celebrate Biblical truth. Seeing the Word takes place with the administration of the ordinances of baptism and the Lord’s Supper. It is no secret that pastors are prone to give their focus to the main gathering. In so doing, it is not uncommon for some to neglect other pivotal gatherings. Not only are pastors responsible for prayer and preaching, but also in preparing for and leading the leaders and staff of one’s church (92-93), insuring that there is a diversity of gatherings that help to address the multifaceted nature of discipleship (97-102), facilitating meaningful and productive member’s meetings (102-104), guarding the ordinances (105-108), and leading a group into greater obedience to and expressions of the 2nd great commandment (109-113). The authors provide a helpful chapter on the topic of “music.” Great stress is placed on congregational singing. Dever and Alexander argue that given the nature and purpose of the church (corporate/worship), the musical portion of the service should be congregational and participatory (116). Though they affirm the edification experienced through the songs and ministries of soloists, they fear that a steady diet of soloists can devolve into spectator worship, thus undermining the ever-important nature and purpose of the church (117). They also caution us to think and lead well even with the musical accompaniment, for this to can undermine a church’s purpose and goal. Music and styles are to be servants of God’s truth and God’s people. Pastors are responsible before God to ensure the musical portion of the service is exhortative, Biblically faithful, and balanced. In the third section, the authors address “Gathering Elders.” The importance of a plurality of elders is often underappreciated. Because of this many churches fail to have a deliberate and adequate structure of government. After giving a convincing case for having a plurality of elders for each local church, a list of compelling practical benefits are offered. A plurality of elders diffuses congregational criticism, adds to pastoral wisdom, indigenizes leadership, enables corrective discipline, and disarms an “us vs. him” attitude (133-134). I certainly agree with all of these benefits, but have specifically appreciated the power of plurality to promote unity by removing understandable suspicion when one man is making or taking away policy. The authors proceed to give some practical suggestions for assessing and installing elders. In the assessment, character is paramount. Character is emphasized in the relevant passages on selecting elders (e.g. 1 Tim 3:1-7). Dever and Alexander reflect why godly character is practically invaluable for the would-be pastor, namely, the pastorate presents an incessant challenge to it (151-152). It's the same reason why gymnasts need to be limber and accountants need to be detail-oriented. Next to character there is ability. There are particular competences one must have in order to pastor well. For instance, an elder must be able to teach (1 Tim 3:2). This doesn’t require a man to be a pulpiteer, but simply one who “is able to explain the Scriptures accurately to other people in ways that profit them spiritually” (145). After ability there is the issue of fit. That is, will this candidate “fit well in the context of the current elders” (146)? The authors list two pertinent factors in determining a fit. Firstly, does this candidate bring balance to the overall strength of the elder team? An elder team filled with men who are good at and want mainly to teach will be unbalanced. Elderships should have a diversity of gifts and passions. Secondly, is there complementarity relationally with the existing elders? No one is perfectly compatible with someone else or with a group of otherwise like-minded people; nevertheless, when incompatibilities contribute to instability and inhibit progress, prudence would dictate that there is a mismatch to be avoided for the good of the individual, elders, and the church (147). In assessing the particular roles and functions of pastors and staffers, Dever and Alexander urge their readers to steer clear of having specialized roles assigned for team members. Specialization would be instanced in a church eldership structure where one pastor was solely in charge of evangelism, another was in charge of youth, etc. They fear that this would breed an unhelpful professionalism in a church context, suggesting that by nature the church doesn’t fare well with such rigid boundaries, neither in the perception of the minister and the church, nor with the execution of an all around ministry (163). The specific hazards of specialization are the twin dangers of fragmentation and territorialism. It is likely, they believe, that pastors who would normally work side by side would end up insolated from one another, developing unhealthy and unbalanced views of their ministry and others. They look to counter this model of staff formation with a “model that contributes to the integration of ministries, the evangelical camaraderie of pastors, and the unity of church members (165). They urge carving up the staff in ways that promote generalism (166-169). The last and smallest section of the book entitled “When The Elders Gather” addresses the particular duties connected to elders’ meetings. This section opens the door for us to observe how the elders at Capitol Hill Baptist Church relate to and function with one another. Out of the gate, the emphasis is placed on the Word of God and prayer. Having been in a number of elder’s meetings, one sometimes gets the sense that the “spiritual” portion is a necessary formality to be rushed through in order to get to the really important issues. I was encouraged to read that these elders spend a good hour in this portion of their time together. Following this time, the elders then move to tackle the agenda. The agenda at Capitol Hill is member-centric and so the first category is “Member Care,” which includes assessing who’s coming and who’s going. It is during this time that the aforementioned care list is attended to. A care list is “an informal list of people whom the elders have recognized as needing special attention for a variety of reasons” (181). A second category is “Administration,” which includes a macro-view of issues such as major renovations and the budget (183). A third category is “Ministry and Missions,” which assesses local and international missions. When it comes to the discussions and decision-making processes of the eldership, both the approach and execution are to be handled in deliberately clear and accessible ways. Many local congregations have experienced painful splits birthed out of one of the most unsuspecting places: the elders’ meeting. Because of this, senior pastors should work especially hard to realize the plurality of godly eldership in this most precious of venues. In addition to suggesting godly patterns of communication and clear structure to the meetings, I found Dever’s practice of allowing other elders to chair meetings to be a particularly helpful suggestion for realizing the godly equality to be had even when there is a first among equals. This offering of Dever and Alexander has been a breath of fresh air for me as a pastor who deals with the doubts, frustrations, holy ambitions, and the unholy ambitions that often distract from God’s established means of grace. 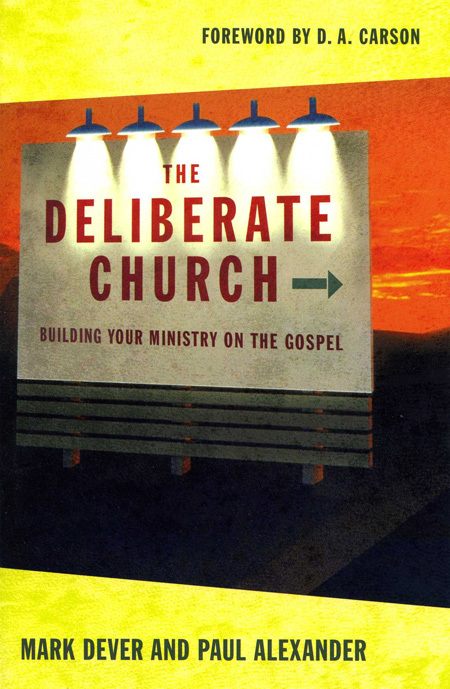 Deliberate Church is a call to not just to build the church, but also to build well.